Only minutes from Sydney Airport, in the heavily developed residential and industrial region of inner southwest Sydney, lies the Wolli Creek Valley, the only remaining natural bushland area of any significant size in this region. Just south of Marrickville and the Cooks River, the Wolli Valley is bounded by Earlwood, Turrella, Bardwell Park and Bexley North and can easily be accessed by train on the T2 Airport line, as well as buses. For thousands of years the Wolli Creek Valley was home to the traditional owners, the Bidjigal clan of the Eora people. The tidal river provided plenty of saltwater foods and old middens can still be seen on the banks of Wolli Creek, near its junction with the Cooks River. The upper creek supplied fresh water and the sandstone outcrops offered many rock shelters. With European occupation came activities such as timber getting, small farms (orchards and dairies, poultry and pig farms) and market gardens. The Wolli Valley was saved from most building development in earlier times by its rugged terrain, flooding, and by being away from the main road and rail lines as Sydney expanded. The East Hills rail line didn’t come through the Valley until 1932. In the 1950s, the green corridor of bush and open space was preserved from development by a major road reservation for what was eventually known as the M5E proposal. In 1984 the Wolli Creek Preservation Society was formed, and it was incorporated in 1987. The fight over the M5E freeway wasn’t won until 1998, when the plan for an alternative tunnel was adopted instead. The M5E tunnel opened in 2002, slightly further south under Bardwell Park and Arncliffe. 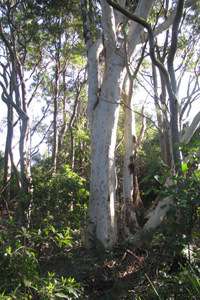 In 1998, the State Government committed to establishing a 60 ha Wolli Creek Regional Park, later revised down to 50 ha. But despite public meetings organised by the Wolli Creek Preservation Society, and much campaigning by WCPS, the transfer of all the necessary land to the National Parks and Wildlife Service (NPWS) (land held by other Gov. agencies and private land holders) is still, as of the end of 2016, not complete. In 2009 the Society became aware of plans by the then Roads and Traffic Authority (RTA) to use land at the western end of the Valley at Bexley Rd. (dubbed the ‘Western Gateway’ by WCPS) for the development of the New M5 (as a tunnel portal); soon to become part of the vast WestConnex project. This RTA-owned bushland had been promised by the RTA to become part of the Regional Park. After again much campaigning by the Society, and a change in the nature of the route of the New M5, the Government finally agreed in December 2016 to have this ‘Western Gateway’ land transferred to the NPWS to be added to the Wolli Creek regional Park. Until all 50 ha of the Wolli Creek Valley bushland are under the control of the NPWS as a complete Wolli Creek Regional Park, it won’t be safe from development and damage.